#8 is Chris Olsen. Congratulations, Chris. I will see you in class. And thank you everyone who showed interest in the class. Perhaps I might see a few of you there as well. 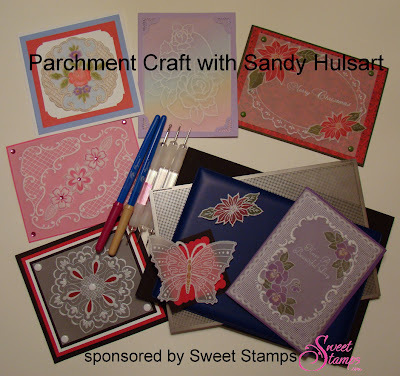 Sweet Stamps is sponsoring my online Parchment Craft class at My Creative Classroom starting on October 11th. In honor of this I will be giving a seat away, simply add your name to the InLinkz you will find at the end of this post. The winner will be picked using Random.org on September 15th. This class is open to anyone who has internet access. Parchment Craft the Sweet Stamps way is much easier than the traditional parchment craft of hand tracing your design onto vellum. We use stamps especially suited to this beautiful art. You will be able to produce amazing results in a very short amount of time. Sweet Stamps is extending my students a 15% discount on class supplies. This class includes narrated slide shows, downloadable PDF tutorials, forums, and student gallery. I would love a chance to learn parchment crafting. What I know I just did by myself, so it isn't a lot! I would love to win this class. My creative classroom has great classes. Taking my first one tomorrow. You are so multi talented Sandy! Loved the last class I took with you at MCC. I don't have a blog to link to but wanted to leave a comment anyway. This parchment work is simply stunning. OMG, although I would love to win this, I might sign up anyway! I love your work, and cannot wait to learn how to do this, thanx for the opportunity! I have admired this technique ever since the first time I saw it used. Beautiful and elegant. Awesome prize giveaway! I absolutely LOVE the look achieved by using the parchment technique! I don't have a blog to link to - and, don't know if my attempt to link without one was successful. But, I think it's awesome that you are so generously giving away a seat to your on-line class. I am just getting started in this so would love a class. Thanks for the chance to win one. Just discovered this blog today and I can't stop thinking about the beautiful parchment work. This class would be a real treat.